On “Good Friday," I thought about how little was good about it. The atonement is a Christian doctrine that is both absurd and horrible. The cross is a symbol of execution and represents Christianity. Iconic images of our country’s major religion are violent and unjust: A powerful male outsider forcibly impregnates a young woman who is engaged to another, and she is compelled to have the baby despite any social consequences. The ruler of the universe has his only son killed in a brutal and unjust manner, and this torture and death of an innocent is considered an act of love. The guilty ones, all the people for whom the son was a scapegoat, go free and never have to be responsible for any of their own wrong-doing. No attention is paid to anyone’s real behavior so that punishments would fit crimes, as they do in modern law. Instead everyone is considered deserving of death and eternal damnation; this includes all since no one is perfect. No one has any opportunity to stand trial, account for their own life, or make their own amends. The ruler-god demands a blood payment. This is nonnegotiable despite being ruthless; forgiveness is not an option, despite the preaching by his son about forgiveness. State violence is used as an acceptable mechanism to administer torture and death, even though the legal process is flawed and unjust; it is the will of the ruler-god and there are no other measures of morality. Might is right. A demand for blood payment must be met. When it is done, the people must accept and be grateful. If not, they must be eternally punished. Justice is far more important than mercy, righteousness more important than love. The ruler-god decides what is just and what can be called love. The son is nothing in comparison with the father-ruler-god. His teachings of love and compassion and forgiveness drop away in the face of the crushing, obliterating horror that is the Doctrine of the Atonement. The image of a bloody, tortured son appealing to his powerful father who will not intervene to protect him is considered a beautiful sight in our culture. It is seen as a symbol of the ruler-god’s love for us instead of a supreme act of cruelty easily prevented. No other religion worships such torture, calling it love, and people in other lands wonder why our god would allow it to happen to his own son. This is the mental imagery in the bedrock of our nation’s Christian culture. It may explain why so many Bible-believing American Christians seem so, uh, unchristian. If one’s moral compass is based on the Atonement, then it has been compromised. It is a morality devoid of rationality, modern legal precepts, and Jesus’ own teachings. It says “judge” rather than “judge not,” teaches punishment rather than forgiving “seven times seven,” and retribution, not loving one’s enemies. It’s really no wonder that the U.S. leads the world in incarceration rates, and perpetuates wars that claim a kind of justice that is recognizable to no one else. The country is addicted to power. Many are more attached to their guns than the safety of their children. It seems no amount of global or domestic suffering makes much difference. 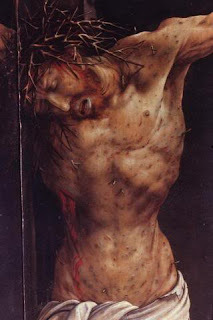 Could it possibly be related to the fact that the most primary icon in our cultural consciousness is a man obscenely tortured with God’s full approval, who then absurdly absolves us of our sins? God was crucified for all sin, including his own because it holds God responsible for creating evil in the first place.Just consider what difference it might make to reject the primitive demands of an imagined tribal god. What if we took responsibility for ourselves and made our own decisions about justice and mercy? We would have to grow up, have some self-respect, and learn to listen to our own wise instincts. It would be a paradigm shift that just might save the world. Here’s another thing to think about. The popular protestant understanding of Christ’s atonement as penal substitution is only one interpretation of the meaning of his death. There are many,, and they have changed through history and across Christian sects. The question raised by theologians is How does Jesus’ death bring salvation? I came across one modern explanation I actually liked (if I had to choose). It says God was crucified for all sin, including his own because it holds God responsible for creating evil in the first place. It’s called shared atonement theory by David Jeremiah, and described by Jamey Massengale in his book, Renegade Gospel The Jesus Manifold . The basic idea is that if “Jesus is homeomorphic to God, the logical consequence is that God died on the cross. The implications in atonement are two fold, 1. That our primary separation from God is that we make the argument of evil, (that there was no just cause for God to create evil which humans suffer from in this life, and may suffer for in the afterlife), therefore God is responsible for it, and is unjust; 2. That God had given a revealed law to the nation of Israel called the by Moses at the Exodus, that defines the sin and Evil, God was responsible for creating and then punishing men for, and is thereby unjust: God bearing the twofold guilt of both satisfies the cry for justice in Gods being crucified and dying for the guilt of all sin.” (More here, including a mathematical formula for showing Jesus is God). Of course all this would be meaningful and not just morally more acceptable if it worked. That is, if it made any difference in the world, or to any individuals. But looking at the state of the world, I don’t think the claims of the New Testament about conquering sin and death have been met yet. More accurate is Jesus’ statement about bringing a sword instead of peace. But in the mythology that is Christianity, I still like the idea of God owning up to making a Very Big Mistake with allowing evil and therefore coming to die for it. ExChristian.Net: Rethinking the "Atonement": Whose Guilt? God was crucified for all sin, including his own because it holds God responsible for creating evil in the first place.